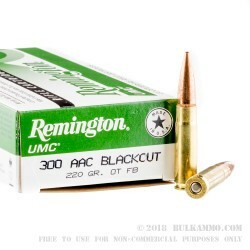 Your.300 AAC Blackout rifle doesn't have to be expensive to feed--pick up a few boxes of this ammunition from Remington! Remington's UMC lineup offers shooters an affordable option for practice and suppressed varmint hunting. 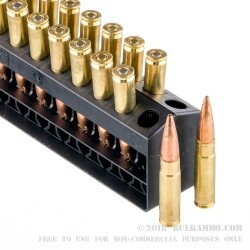 These cartridges fire open tipped projectiles and use reloadable brass cases fitted with non-corrosive Boxer primers. 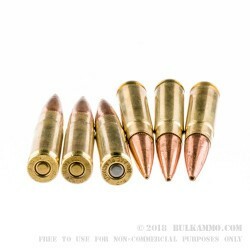 The projectile weighs in at 220 grains and flies at a subsonic speed for soft report when combined with a suppressor. A flat-base shape gives the bullet consistent muzzle exit for improved stability in flight. This combines with the open-tip construction to produce strong accuracy. 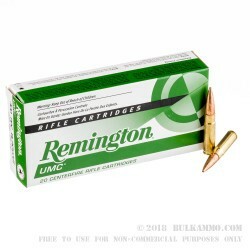 Remington is one of the U.S.'s oldest and well-known firearms manufacturers.